Mary pulls from the values she got from a life of hockey as she battles her second cancer diagnosis. 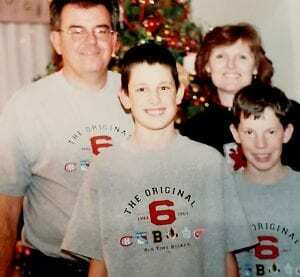 The Pekara family shows off their old time hockey shirts in this old Christmas photo. Photo courtesy of the Pekara family. Mary Pekara’s love for hockey started at age 6. She’d sit next to her father in their suburban Chicago kitchen after dinner, or in his car, listening to Blackhawks’ radio broadcasts. But it wasn’t until she was 21 — with a new man by her side — that Mary got to see the hockey stars she had only heard of play. Her employer, who knew how much she loved the game, gave her all of their Sunday home-game season tickets. The couple married in 1981 and moved to Fort Collins. Their love for hockey continued. The Colorado Rockies were a NHL team in Denver from 1976 to 1982. 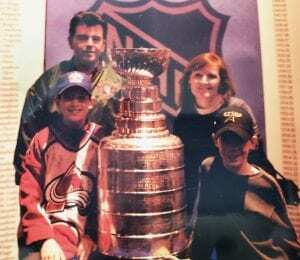 Pekara family stands beside the Stanley Cup in Feb. 2001 when it was in Denver for the NHL All-Star game. Photo courtesy of the Pekara family. Mary said the players’ motivation and teamwork always inspired her. And it was those values that she instilled in her sons as they began to play hockey – guidance that served them through their childhood, both on and off the ice. Now, years later, as she battles her second diagnosis of cancer, she pulls from those same ideals. In 1995, the Pekara family was thrilled when the Nordiques moved from Canada to become the Colorado Avalanche. The following year, Mary’s boys — then 5 and 7 — had just started competitive hockey when the Avalanche defeated the Florida Panthers in a four-game sweep to win their first Stanley Cup. She treasures the memories she and Bryan have shared — watching the 1980s USA Olympic Hockey team win the gold – and attending all of those NHL games. But the best memories, Mary said, are those of watching her sons play. Bryan, now 29, is a forward, and Joe, 27, a goalie. As kids, the two practiced in the driveway nearly every day for hours, making each other better and more competitive, Mary said. 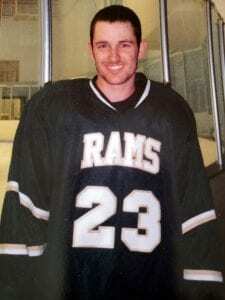 Bryan Jr. played hockey for Colorado State University and became an all-star senior. Photo courtesy of the Pekara family. Mary spent more than 10 years managing their youth teams. She served on committees, helped with fundraisers and organized details. Bryan Sr. volunteered, too, as the scorekeeper or fulfilling penalty box duties. The family traveled to Denver for the Avalanche Freeze Play Clinics at McNichols and attended two state championships — Bryan Jr.’s team won both — in peewee and midget leagues. Marys youngest son, Joe, playing hockey. Joe was 2009 Northern Colorado Youth Hockey player of the year. Photo courtesy of the Pekara family. Joe said hockey helped him come out of his shell, but Mary contests that it did that and much more. Mary Pekara. Photo courtesy of the Pekara family. At the start of her sons’ teenage years, Mary was diagnosed with breast cancer. She underwent a lumpectomy and radiation treatment, and was able to spend her kids’ prime hockey years in remission. “We had some great road trips, and it was enjoyable to be with them and their teammates,” Mary said. They traveled all over the United States, from Washington, D.C., to California, as well as into Canada. In 2009, Joe was named Northern Colorado Youth Hockey Player of the Year. Bryan Jr. went on to play for Colorado State University and became an all-star senior. Then, in 2016, cancer returned. In August of that year, Mary had a mastectomy to address her returning breast cancer. The cancer had not spread, but three weeks after her surgery, doctors found a mass on her lung. Despite having never been a smoker, Mary also had stage 4 lung cancer. Cancer is prevalent in Mary’s family, as many direct relatives have been touched by cancer at some point in their lifetimes. The same week Mary had her mastectomy, her brother was diagnosed with stage 4 lung cancer. He was a smoker, Mary said, and three weeks later he had a stroke and developed blood clots. 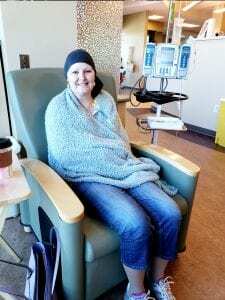 Mary Pekara at the UCHealth Cancer Center – Harmony Campus in Fort Collins. Photo courtesy of the Pekara family. Mary’s cancer is aggressive. It has spread throughout her body, including her brain, liver and bones. She’s had several rounds of radiation, which have been successful, and she’s also had three brain stereotactic radiotherapy surgeries to remove 35 tumors. It is Mary’s positive attitude and lack of fear that have gotten her so far, Medgyesy continued, as well as her trust in her medical team and compliance with their prescribed treatment. Mary has recently started targeted therapy — medication that shuts down a cancer-cell pathway that drives the growth of the cancer cell. A past years Christmas letter photo. 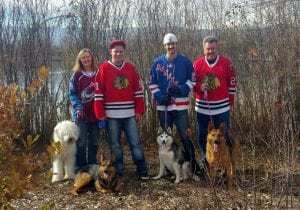 Mary, Bryan Jr., Joe and Bryan Pekara are all hockey fans. Photo courtesy of the Pekara family. There are similarities between hockey and battling cancer, Mary said. It’s a daily battle in which one must keep a positive attitude, maintain the motivation to keep fighting and work as a team member. It’s not unlike how hockey players, win or lose, move on to the next game, Mary added. Hockey Fights Cancer is a national initiative to raise awareness of cancer. 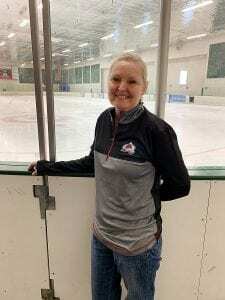 Mary will be among those recognized with special ceremonies prior to puck drop and throughout the 7 p.m. Nov. 16th Colorado Avalanche vs. Washington Capitals game at the Pepsi Center.